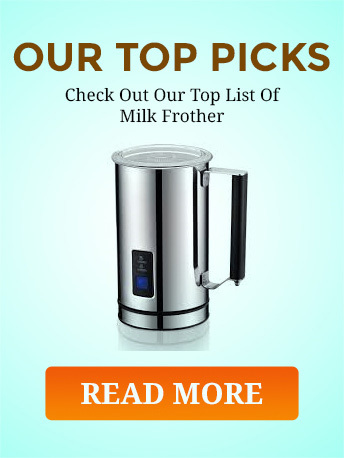 A portable milk frother that can froth warm or cold milk. For a very lean investment, you can create specialty coffees, cocoa, or teas blended with milk at home. 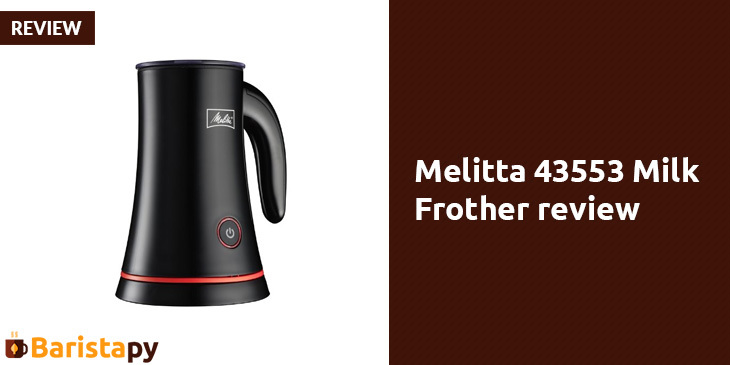 The Melitta 43553 Milk Frother is made by Hamilton Beach for Melitta. Hamilton Beach, of course, makes all kinds of food and beverage preparation and food production appliances. This particular model is a discontinued unit, and it’s reported that replacement parts are scarce and difficult to get. 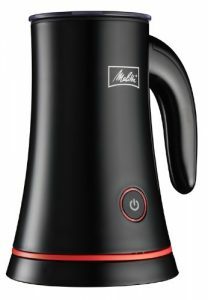 The Melitta 4355 is the ultimate budget electric milk frother at only $29.99 with free shipping from Amazon. A one button automatic frother. Push the control once to froth warm milk, twice to merely warm your milk, and three times to froth cold milk. A guide to remind the user of how the button works is situated on the lid. Temperature cannot be adjusted with precision. Yet, good tasting lattes and cappuccinos can still be created. This budget unit is designed to froth or heat only enough milk to make one latte or cappuccino at a time. It’s not for higher volume production of froth. So consider the amount of coffee you drink in a morning before you buy. The container is fully portable in that the power cord attaches only to the base. It has a very stylish shape. Has an attractive black color with red trim that looks good on the kitchen counter. For safety, the machine shuts off automatically when it reaches the warming or frothing temperature. And it also shuts down automatically when the liquid threatens to boil out completely. You are protected from cooking your milk until it’s dry. The size is average for an electric frother with dimensions of 6.1 x 6.7 x 8.4 inches. Weight is 3.5 lbs. The heating element is within the base. A spindle design does move the frothing whisk. So do consider my note on the problem of locating replacement parts before you buy. Spindles do wear out on frothers. Melitta is a company name known in the coffee industry. Headquartered in Clearwater, FL and experienced in coffee making. The slogan that brands their products is “The Flavor of Europe in Every Cup.” The frother is backed by a 1 year warranty protection for defects in materials and workmanship. Knowing that buyers of a basic frother like the 43553 may not know how to make specialty coffee drinks, Melitta has printed recipes in their Use and Care Guide to teach you how to create lattes, cappuccinos, etc. Q: Why not save even more money and buy a motorized whisk? A: Handheld devices still require more time and attention than electric automatic frothers. Be careful investing in a discontinued product. This one’s quality is not the best.